Snapped this photo at Yokohama yesterday. 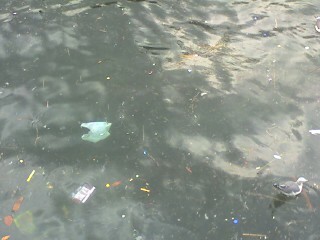 Lots of plastic bags in the water. This post for my “Blog Action Day” that I mentioned a few days ago. I have made a donation to Morsbags - a non-profit, social, guerilla, grassroots community devoted to reducing the use of plastic bags due to the impact on the environment. I’ve literally taken the Slow-Boat-to-China(tm) several times from Japan. The entire time of my two and half day trips to Shanghai, the open ocean had plastic bags gayly festooning the gray water, meh. Studies have shown there are 6 times more plastic debris in the ocean than there is plankton. Plastic bits break off into small pieces the same size as plankton and large fish have more plastic in their bellies than ever before. Sounds pretty gross if you ask me. That is awful…I saw other things about Oceans of plastic and I was in disbelief. Whether it’s an mmorpg community or green community people need to band together and voice their opinions/interests/beliefs. people need to start thinking of the environment. They can’t just ignore it and hope everything will be alright or someone else will clean up after them. We need huge fins for literring. When you get a $500 bill for dropping garbage out of your car, you’ll learn your lesson! I offer to thee Keitei goddess kami of the ocean, a bag of starbucks coffee from sumatra, poured forth to summon those that pollute the oceans to the dooming sounds oof the mermaids of yore. Om mani padme hum, rapanui rapanui om mani padme hum, rapanui rapanui oy.